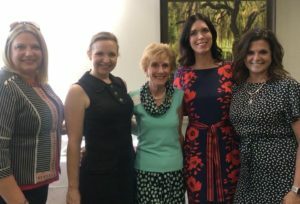 In conjunction with the Junior League of Dayton’s 80th anniversary celebration, the Katharine Kennedy Brown Community Leadership Award was created in honor of the service of Junior League of Dayton Sustainers. Named in honor of the first President of the Junior League of Dayton, the award is to be presented annually to a Sustainer in recognition of her demonstrated dedication and commitment to voluntarism, the Junior League of Dayton mission and vision, and service to the greater Dayton community. Any Sustainer in good standing is eligible for nomination by another Junior League of Dayton member, a community member, a family member, or through self-nomination. A five-member selection panel comprised of the current Junior League of Dayton President, the Membership VP, the Sustainer representative to the Executive Board, the immediate past Sustainer representative to the Executive Board, and a member of the Community Advisory Board will review the nominations and select the annual recipient. (If either Sustainer representative is a nominee, she will recuse herself from the panel and the President will select another Sustainer representative to participate as a panel member.) The Membership VP will manage the nomination process and act as secretariat to the panel. The award is to be presented at the annual dinner/meeting in May. The Silvio Family Memorial Scholarship was established in memory and in celebration of the lives of JLD active member, Sheilah Johnson Silvio, and her husband and twin sons whose lives were tragically ended as a result of an automobile accident in December 1999. Due to the longtime commitment of Sheilah’s family to helping youths and the family’s active involvement with the St. Joseph Children’s Treatment Center (CTC), the JLD chose to honor the Silvio family’s memory through the establishment of a scholarship fund. An award will be presented annually to a student at St. Joseph’s CTC who wishes to further his/her post high school education or training. At the 2017 Association of Junior Leagues International (AJLI) Annual Conference, the Junior League of Dayton was recognized for excellence in marketing and communications for its Kids in the Kitchen public service campaign.